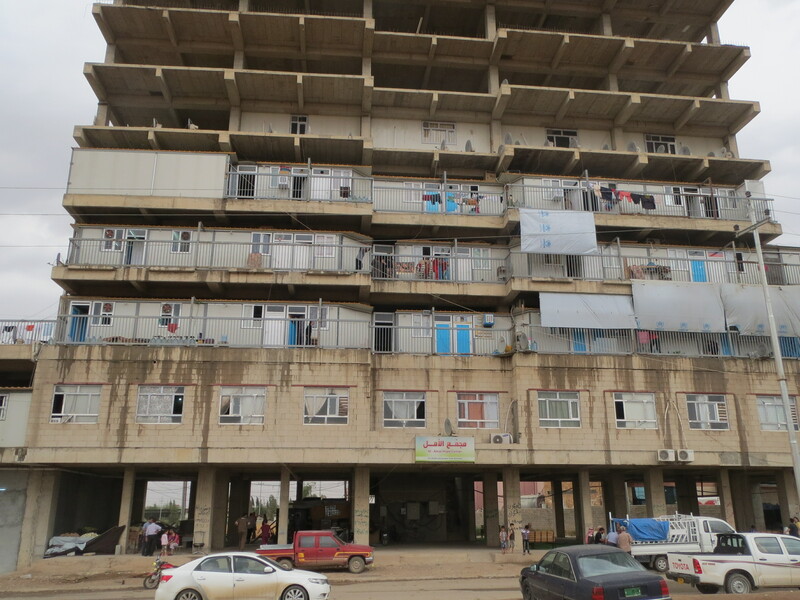 Unfinished buildings near the airport have been partitioned to give each refugee family one room. Kitchen and bath facility is shared. A major purpose of our mission to Iraq in September was to determine the possibility of Christmas programs for children there this December. Because of the almost constant daily bombings in Baghdad, that city was ruled out immediately. Bringing hundreds of Christian children to one location in Baghdad would be inviting disaster. Kurdistan, on the other hand, is relatively untouched by Islamic terror, other than the constant attempted advance of the Islamic State army. 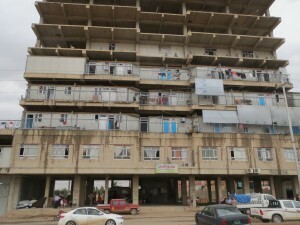 Only a few years ago the population of Erbil, the capital of the Kurdish region of Iraq, was just 1.5 million. The population is now twice that number. Terror bombings are rare — the last one occurring on April 18th at the U.S. Consulate, which looks more like a military compound than a consulate. During a September mission trip to Iraq, two events were held with meals and faith building programs for the children. The performance of the ministry we contracted to conduct the program proved beyond a doubt that they had the ability to move hundreds of people to an event, have a program for them, provide about a week’s worth of food for each family to take back with them, and return them safely to their homes. In one instance 230 people were successfully moved from their camp to a park where a trade and book fair was taking place, fed hot meals and returned home. There were some mistakes, as this was a learning effort. In the case of the park event, it was on a day when the temperature reached 107, and the meal had to be served late. By the time the distribution was complete, it was difficult to locate the families because they had spread out in the park at night. This is understandable, as these refugees are literally on top of each other 24 hours a day, and a chance to separate and have a private family meal in a pleasant outdoor setting was a welcome relief for many. Fortunately, all managed to make it back to the buses! The ministry we work with in Erbil has constructed two meeting centers and has a third under construction for the only purpose of ministry to Internally Displaced Persons (IDP’s) or those commonly called refugees. The sites were inspected and are perfect for the Christmas dinners we are planning in Erbil. 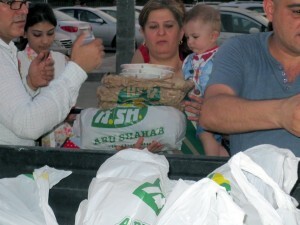 Meals were distributed at park away from the refugee center. Our new ministry partner in Erbil has even greater capacity than that needed for the Christmas programs we will sponsor this year. Our original plan this year in Iraq was limited to about 500 children aged six to twelve. Since we may be able to obtain partners for the program in Iraq, this may well expand. The half day Christmas events will include transportation, puppet shows, games and activities such as Christian themed coloring books, singing carols and of course a hot Christmas meal. Each family will be given enough food for about one week. Brochures have been printed that can be given to friends and relatives to promote the Christmas for Refugees program. If you want some of these to give to Sunday School members, relatives or friends please call 202.729.8380. If you have a Facebook account please “friend” Facebook.com/ChristmasForRefugees. We can raise many of the funds needed using social media in October and November with your help! Please share this post on both Facebook and Twitter as this will assist us in providing for even more children. Please help our planning by giving your gift to the program this year today! Donate here. Below is a video of the distribution of food. Do you need volunteers to help?